The sky over Mount Rainier was simply sublime last night in this photo shared by Richard Hildahl from his perch on Filucy Bay. Rain finally fell overnight as temperatures rose above freezing. It is currently 47 degrees and cloudy with a slight chance of more rain. The low temperature tonight will be a balmy 44 degrees with a very good chance of rain, according to the National Weather Service. 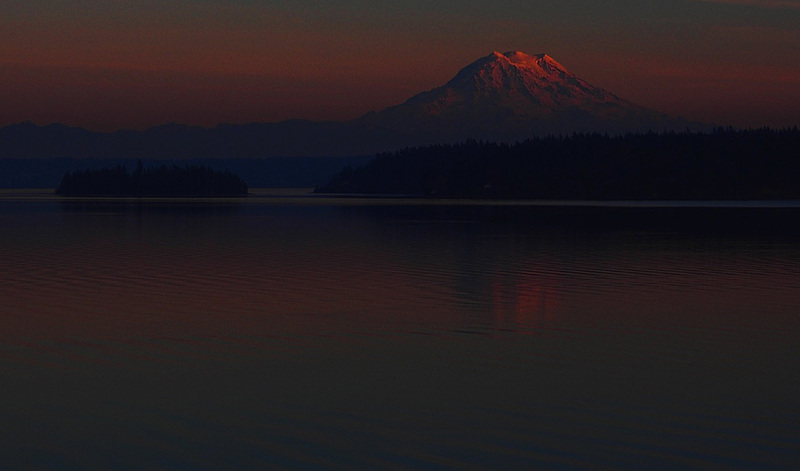 We did get a beautiful sunset last night, turning the sky over Mount Rainier crimson. The burn ban for Pierce County was also lifted by the Puget Sound Clean Air Agency. This means more rain and wind in the lowlands, snow in the mountains, Mass writes. “Nature simply couldn’t help itself,” he writes, as we slide back to our wet period of the year.